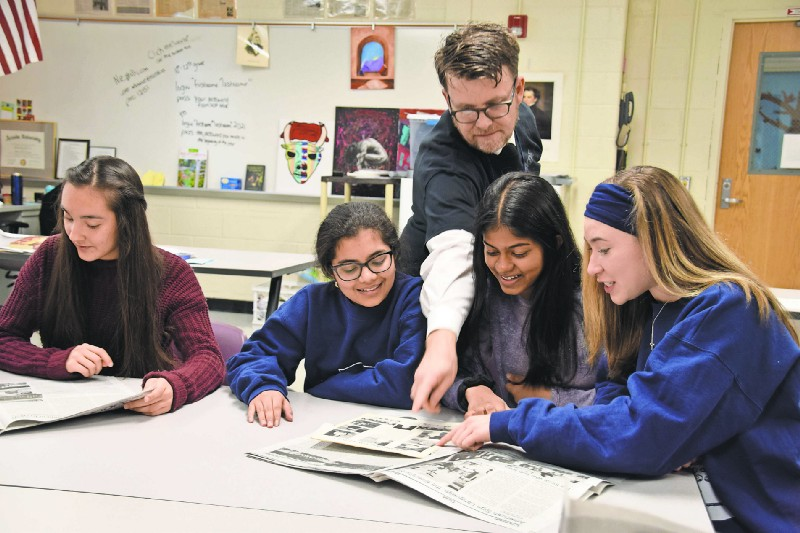 Eastern Regional’s 52-year-old newspaper won 25 Garden State Scholastic Press Association awards. From a commentary about hallway PDAs to an investigative story on recycling, the comprehensive reporting demonstrated in recent editions of Eastern Regional High School’s “The Voyager” landed the online and print publication 25 awards at the 2017 Garden State Scholastic Press Association Awards in October, including Overall Excellence in the state for Division A. The assortment of achievements encompassed second place for the Distinguished Journalism Award and four first-place awards — the most top prizes ever achieved by the 52-year-old school paper whose alumni have worked at publications such as the “Boston Globe” and “Billboard” magazine. Based upon three issues this year — March, May and June — “The Voyager” clinched 317 out of 320 points in the Coverage category, 345 out of 350 points in Writing/Editorial and 308 out of 315 points in Design. Despite producing seven to 10 issues each year, the staff, composed of both club members and journalism class students, voted on these three issues for submission in the competition, feeling these editions showed their best work. “We’ve always been pretty diverse in our article choices, but I think those were the editions that showcased that the most,” said junior and managing editor Srishti Ramesh. A predominant number of the the 20-plus page issues feature pitched articles, as students gather news tips in class discussions, current events or simply hallway banter. Utilizing skills taught in the journalism electives, the students follow professional reporting procedures — interviewing, fact-checking and, above all, finding the truth. Pitched stories especially allow students to bring their own flairs and fervers to the pages. Like any newsroom, the staff faced some editorial and ethical concerns throughout production of these issues. Along with layout challenges, such as fitting major stories across a “double truck” design — a pair of facing pages with content that stretches over both pages — these issues received some criticism for their lack of conservative articles, particularly in commentary pieces regarding national and global controversies. Eastern students tend to lean more liberally, according to the staff, making it difficult to mirror the student body’s opinions while also remaining unbiased. “The school’s name is on the newspaper. We represent the school but we’re also acting as journalists — we have to find that balance,” said last year’s co-editor-in-chief Isabel Begelman, a freshman at American University. However, throughout the school year, it seems the students gained enough experience to be well quipped on such problems, which is another reason why latter 2016–2017 editions were selected for the GSSPA. 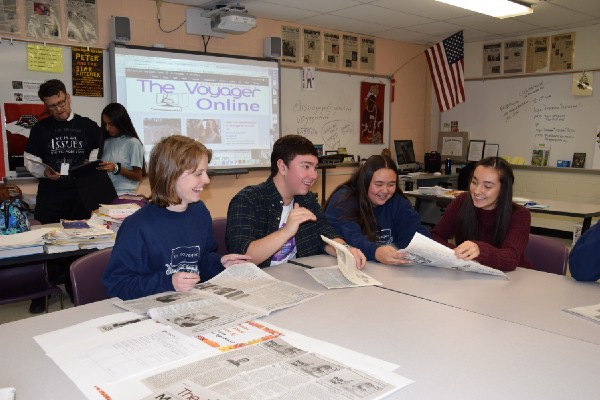 The reporters say that as they delve deeper into their high school, and “Voyager” careers, they evolve as reporters — something especially evident in the March, May and June issues. “You get more comfortable throughout the year and you get more confident in your writing, and I think that really shows in the editions that we picked,” Beluch said. The collaboration of lower and upperclassmen also contributed to the quality of these issues. The common bell lunch schedule, implemented in the 2016–2017 school year, helped make this partnership possible, allowing the staff to hold meetings once every four days during lunch. “I think a lot of our success comes from when the whole team comes together, as opposed to when it’s just the higher-up people working on it,” said co-editor-in-chief and senior Alex Mackle. The staff says students and teachers throughout Eastern are receptive to the newspaper, sparking dialogue in classrooms and hallways. Also, 2017–2018 is the inaugural year for the paper’s website, making the news even more accessible and interactive for more than 2,000 students. 1st place to Jared Gans for Column writing for Boy Meets Gov.